Imagine a jury comprised of building professionals and representatives from the target community ranking the contest submissions, with the highest ranked designer then partnering with homebuilders and private sector investors committed to mass producing their homes using local materials and labor. Finally, imagine, those homes being built by a tri-sector partnership of business, government, and nonprofit leaders in slums or refugee camps around the world or on Native American reservations in the United States, where they would be used to help address the crippling levels of homelessness through a micro-financing lease-to-own program. 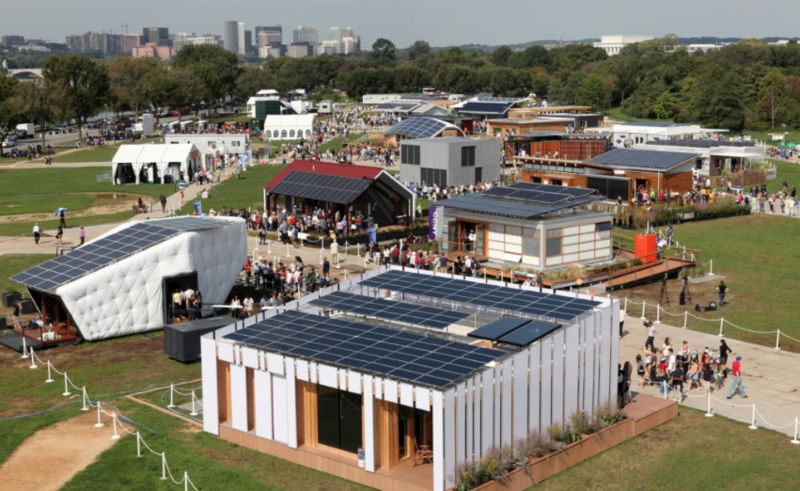 Imagine this, as the next chapter of the Solar Decathlon. Provides participating students with unique training that prepares them to enter the clean-energy workforce. Judges select the winner at each Solar Decathlon as “the team that best blends affordability, consumer appeal, and design excellence with optimal energy production and maximum efficiency.” While collegiate teams built 114 homes for the U.S. Solar Decathlon between 2002 and 2015, only 37 of those homes were being used for permanent residential or guest housing as of May 2017. The remainder have been converted to office space or cannibalized for use in new homes.